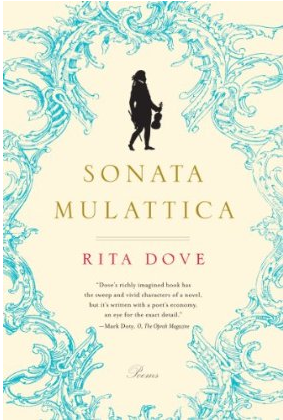 Rita Dove’s poetry is seductive. Her narrative verse reels you in because it’s like reading a page-turner of a novel that suddenly immerses you in her beautifully recreated world. It is always a world she has taken the time to carefully research. In 1986’s Pulitzer Prize winner Thomas and Beulah Dove’s subject was the adventurous and bittersweet epic lives of her grandparents, who survived and loved through the Great Depression and into the Jim Crow era in Akron, Ohio. I remember reading it in college and feeling blown away, challenged by the sophistication and intelligence of her work. Now with Sonata Mulattica, the former Poet Laureate gives us the obscure world of George Augustus Polgreen Bridgetower, a virtuoso violinist and accomplished performer in his own right in the late 1700's before he eventually met, performed with, and inspired Beethoven. Beethoven’s famous Violin Sonata No. 9—or the “Kreutzer Sonata”—was originally written for and dedicated to Bridgetower, the son of a black man who described himself as an “African Prince” and a white Polish/German woman. It’s sad but true that were it not for what Dove describes as a “saucy remark” made by Bridgetower about a woman Beethoven possibly had in his sights, a remark that so infuriated the composer that he angrily erased his dedication to the young violinist, the world would know him. We should be calling it the Bridgetower Sonata instead of the Kreutzer Sonata! Besides Beethoven, other key figures are given voice in the poems: his father Friedrich, a well-dressed philanderer who remained dedicated to the crafting of his son’s image and seized every opportunity to showcase his amazing talent; the famous composer Franz Haydn, under whose tutelage the young Bridgetower remained while he lived on the estate where Haydn was musical director; Mrs. Papendiek, Queen Charlotte’s “wardrobe keeper,” who watched the child progidy perform at Windsor and recorded her front-row experiences in her diary. There is a short play among the poems called “Georgie Porgie, or a Moor in Vienna” in which Dove lets all the major characters hilariously act out the events leading up to the sonata episode. I enjoyed her funny exploration of the way it might have happened, but I am saddened by Beethoven’s hasty decision and attempt to erase the man’s name from his beautiful work of art forever, and hence musical history. Still, I am thankful for one woman’s poetic imagination bold enough to resurrect this fascinating story, and I am also thankful for one of my favorite films, Beethoven. In the movie there is a scene that lasts only seconds: a black violinist is warming up in a roomful of white musicians. (I don’t really need to say anything about the poignancy of that description, right?) It was this scene that sparked Rita Dove to begin her research. I haven’t seen the film in a long time but I plan to watch it again soon, just for a brief glimpse of the one and only George Augustus Polgreen Bridgetower.